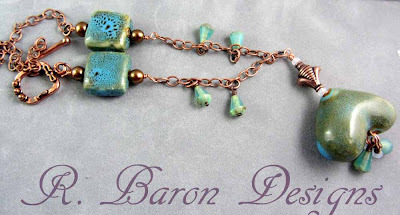 R. Baron Designs: Bead Soup #7 Reveal! I LOVE these colors! Copper chain plus greens is so yummy! This is such a delicate piece, it's beautiful. Great idea to use the heart the way you did...the whole necklace is breathtaking! Your necklace is so classy ! I love how you used the heart upside down. Amazing work ! I love what you made with the soup I sent to you! It's an awesome piece! I just love what you did with the focal heart....and it was outside the box for sure. Love the dangles and how you used the toggle. Great minds think alike...I used the toggle in the same way, but on the opposite side. I love what you sent to me and hope to see you at the next party! Turning the heart upside down was definitely inspired! Great work! Very Beautiful....I love the color combination and how everything fits just right. Rachel - love the original twist you gave this piece by turning the focal upside down - and the dangly drop beads along the chain are so sweet! Well done! Great romantic looking necklace. Very pretty! Very classy necklace! understated and elegant. Great work! Way to improvise with your soup goodies - love it! Great piece! Love the way you used the focal. Unique twist on the focal and it works...very pretty. Love you necklace, nice work! Pretty necklace and nice balance! Turning the heart upside down was GREAT. I have a love-hate relationship with hearts. They can be so cute, but sometimes it seems like they are terribly over-used. I'd like to know when you wear it if people have an "ah ha" moment and realize that it's an upside down heart. It looks like you have lots of leftover soup left to use in the future. Well done! I'll have to let you know Liz, I'm a little curious, too, as to whether people will notice that it's an upside down heart! and the heart becomes a spade - that's thinking outside the box! Very Clever! I'm not a huge fan of hearts so I love how you inverted it to make it not a heart.lol. Lovely job. I really like the copper with the beads. I, too, am not a fan of hearts (I received one in my soup ingredients) but what you did is cool! Thanks for sharing your ideas. What a great idea for the heart focal. Lovely necklace! Such a sweet piece. Love hearts. A beautiful piece - love that ceramic (I had some lentils in my soup :) ) and the whole design flows so beautifully! Great job Rachel! 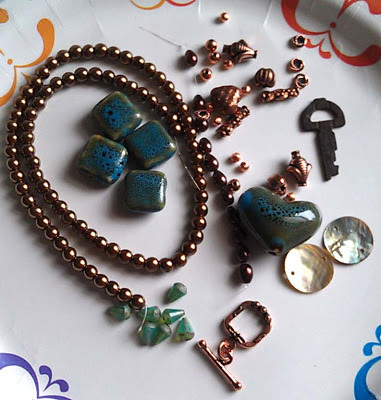 The copper chain goes perfect with those beads! I love the way you used the pendant! Thanks for sharing it with us, Rachel. Like your unconventional use of the upside-down heart. I really like how light and feminine the necklace is very nice. I really love this necklace.. very gorgeous. 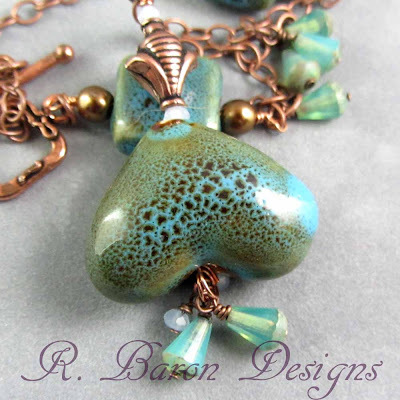 Nice use of the heart bead, pretty soup. I love what you did with the heart !! I like the unconventional treatment of the heart - and the clasp on the side where it can be seen and appreciated. Nice work! elegant design! I always like putting the clasp somewhere other than the back! Very pretty-I like that you used the heart upside down. Sooo Pretty! Love the ceramic beads! I think your design is original and really cool!!! Have a Blessed Day! Love the way you balanced out the design and the heart upside down is way cool. Very nice, love that you weren't afraid to use the focal in an unconventional way. I like the heart upside down. You used your soup well. I think using the hear upside down is a great idea. Beautiful piece! 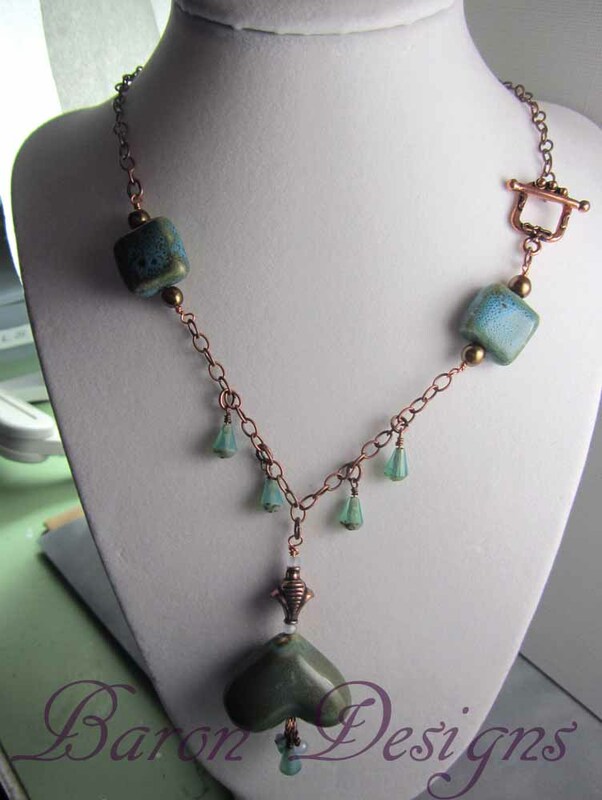 I instantly noticed how the clasp goes so well with the square beads :) Beautiful work! I LOVE how your framed the dangles with the beads! Just beautiful. Turning the heart upside down was an inspired idea. Great desing. I just love the idea of turning the heart upside down! How inspiring! I love that you turned the heart upside down...made it so different. What a lovely necklace! The upside down heart was really unique! Pretty piece! I love what you did with focal and the colors are great! I'm still hopping the first reveal :) I love the upturned heart, like everyone else, but I thing what makes it work so well is the copper bead just above it. Beautiful necklace! Love the design. Nice idea - repeating the square motif. Love how you incorporated the toggle into the design,fabulous. I love everything about this necklace! Beautiful necklace and very different treatment using the heart upside down. I would have never considered turning the heart upside down. Great job thinking out of the box!! A really pretty, wearable necklace. I too would not have thought to turn the heart upside down. What a great idea!